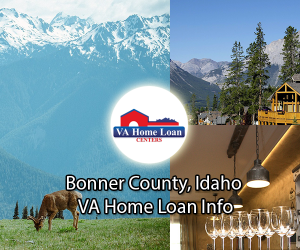 The 2019 $0 down, VA home loan limit for Bonner County is $484,350. For some of the most beautiful terrain in Idaho, come to Bonner County. Bonner County was officially established on February 21, 1907 and was named after a ferry operator, Edwin L. Bonner. The county is located in northern Idaho and has a total area of 1,919 square miles. With many areas for outdoor activities, Bonner County is the perfect place for any nature lover. The county has many lakes and rivers perfect for boating, swimming, and water sports. Bonner County has a total population of 41,585, including a veteran population of 4,676. Part of the Kaniksu National Forest is located in Bonner County. Kanisku National Forest is one of the best places to see the beautiful landscape of Idaho. The forest has a total area of 1,627,833 acres and expands into Idaho, Montana, and Washington. Kanisku provides excellent opportunities for hiking, mountain biking, rock climbing, and more. For those weekend camping trips, there is no better place than the Kaniksu National Forest. Hikers will enjoy the Pacific Northwest Scenic Trail, which is partly located in Bonner County. One of the most beautiful trails in the country, the Pacific Northwest Scenic Trail runs from Montana to Washington. The trail is 1200 miles and features some of the most interesting plant and animal life. Passing through the Rocky Mountains, the Pacific Northwest Scenic Trail is an excellent place to take in some majestic mountain views. Priest Lake is one of the many large bodies of water located in Bonner County. The lake is 19 miles long and is great for many aquatic activities. The convenient boat docks make taking a relaxing boat ride easy! There is a vast population of wildlife that makes their home in and around Priest Lake. For some of the best fishing opportunities in Idaho, visit Priest Lake. Other lakes and rivers in Bonner County include Clark Fork River, Kelso Lake, and Pack River. The downtown areas of the cities and towns in Bonner County feature some of the best restaurants and shopping opportunities around. You are sure to find a restaurant to satisfy anyone’s taste buds in Bonner County. For antiques, clothing, and small mountain stores, visit downtown Sandpoint. There is a Veterans Services Office and many other veteran resources located in Bonner County. Veterans in Idaho are offered educational benefits, tax cuts, and many other benefits. The median housing cost is $222,200, and the median household income is $41,414. For the best home financing, call VA Home Loan Centers at 888-573-4496 to complete a VA loan application. 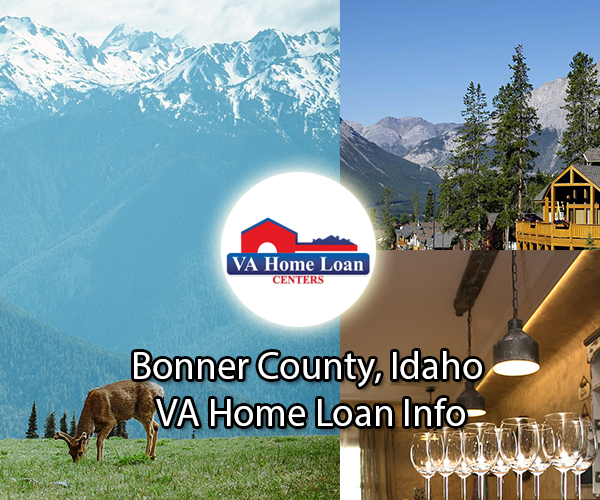 Contact VA Home Loan Centers for help finding a condo, home, or other type of property in Bonner County. There do not appear to be any VA-approved condos located in Bonner County. Let VA Home Loan Centers help you obtain VA condo approval.